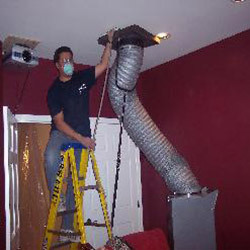 At J & J Air Duct Cleaning & Decontamination, we get the job done correctly, the first time. 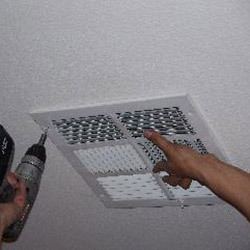 Our procedure is to get in and do an in-depth cleaning of your HVAC system and air ducts, so all that is left will be scheduled maintenance. 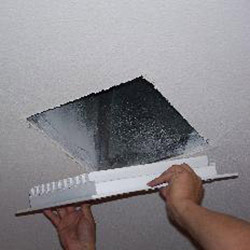 We are certified by the National Air Duct Cleaning Association (NADCA), the highest authority in the country in the air duct cleaning industry. 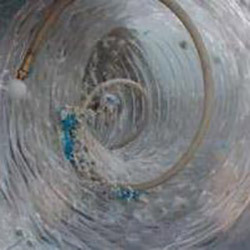 To learn more, read our step-by-step process for air duct cleaning service, and see just how thorough our HVAC duct cleaning is. 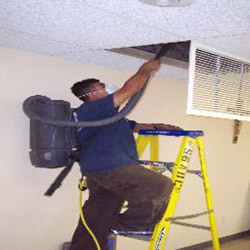 We recommend scheduling an air duct cleaning for your Las Vegas home or commercial building at least once every year, unless our HVAC cleaning professionals suggest differently, to keep the air quality the best it can be for your family or employees. 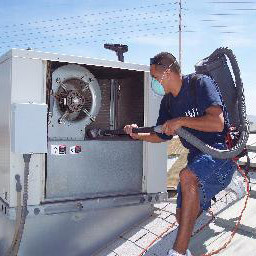 Contact us to schedule air duct cleaning services in the Las Vegas area! 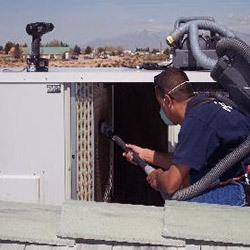 702-213-1985 Or get a speedy fast quote here. 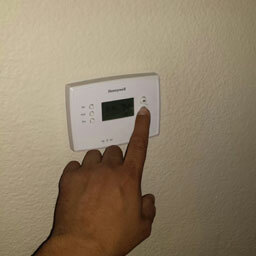 We begin by testing your HVAC system. 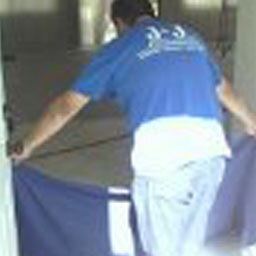 We cover furniture and flooring in all work areas. 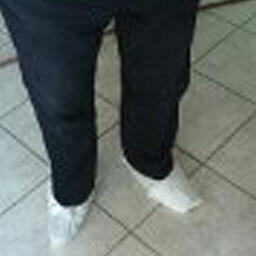 All of our technicians use shoe booties to protect your flooring. 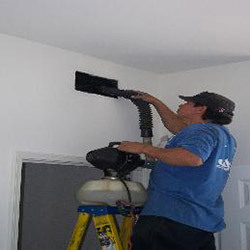 We will remove wall, ceiling, and floor vent registers. Then we plug supply duct openings with foam register plugs and block the cold air return to put the entire system under negative pressure. We will wash all registers. After testing the system for proper operation, we disconnect the power before opening the unit for safety. 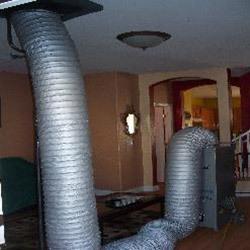 We open your HVAC unit to vacuum the interior of the Furnace/Air Conditioner. Then we clean the cooling coils with a HEPA vacuum and a coil cleaner. 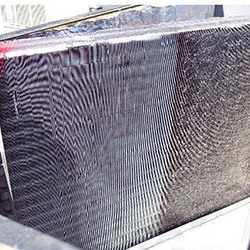 This picture shows the before & after clean sections of the cooling coils of a regular Furnace/Air Conditioner. 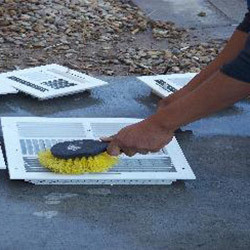 Cleaning the cooling coils will ensure more efficiency for your A/C unit. 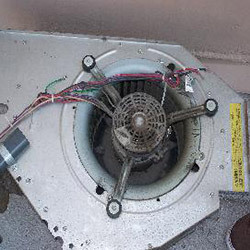 We will clean the blower unit and, if needed, we will remove the blower unit to properly clean the blades, since they can accumulate lots of dust, dirt and contaminants. In the last step of cleaning your furnace/air conditioner, we use the atomist fogger to decontaminate the interior surfaces with Sporcidin, an EPA approved biocide that eliminates allergens, contaminants, and bad odors. We will attach the turbojet negative air machine to the system. It can be attached to the furnace plenum, a floor duct or a ceiling and wall duct with the pogo pole hose adapter. We will pre-vacuum the intake cold air return and seal it to create negative pressure (a.k.a. a vacuum) throughout your system. Then we’ll dislodge and remove all dust, dirt, debris and contaminants from the ducts by using mechanical tools like the sidewinder air powered (snake) tool whip or cobra brush, depending on the type of duct you have. 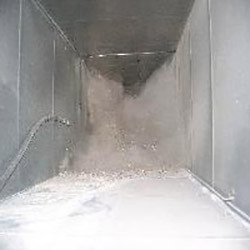 All this while putting your duct work system under negative pressure with a HEPA filtered turbo machine to collect dust and avoid cross contamination. 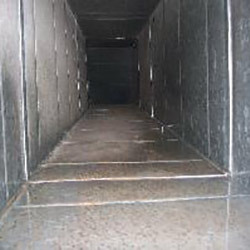 Sanitize and deodorize all supply and return duct-work. Re-install all supply and return vents. Vacuum the floors of working areas.